Three and a half years ago my then 79-year-old mother had her left hip replaced because of severe arthritis. She had the right one done about 10 years before and it changed her life in so many positive ways. When the left one began to hurt she put it off for a long time, but eventually she was unable to walk and in constant pain. Her original surgeon had retired so she was referred to a new one (Surgeon A). After waiting several months she had the surgery. I spoke to her a few days later. Everything was going well. She was reaching every milestone. She didn’t get an infection. She didn’t need a blood transfusion. She was discharged 7 days after her surgery. At home on post operative day 8 she was standing in the kitchen and heard her leg crack. She fell in agony. Her femur (the thigh bone into which the new joint had been hammered) had shattered. She needed emergency surgery to replace the hardware and to try and put the fracture back together. This second surgery was done by Surgeon B. When I spoke with him the next day he said, “It required an intricate system of pins and wires to get your mother’s femur together.” Her osteoporosis was so bad her femur had shattered like glass. It made me think of Humpty Dumpty. If she were lucky this would be a very long recovery with a sub optimal outcome. If she were unlucky she would die. These are the choices for a second surgery within a fortnight for a 79 1/2 year old woman who has a shattered osteoporotic femur that holds a nail like glass. “How did this happen.” I asked? Part of the her new hip (the hardware) was hammered into the femur. After the surgery an x-ray was taken to look for hairline fractures in the bone. This is standard. If there is a crack the surgeon has to know. Sometimes it means a trip back to the operating room and sometimes it means delayed weight-bearing, it depends on the fracture and the patient. Surgeon B told me he reviewed her films. It didn’t seem that a fracture was missed. It was just one of those things. Sometimes they are too small to see. My mother’s operative and post operative courses were terrible and she hit almost every complication on the check list. Blood transfusions. Infection. Infectious diarrhea. That she didn’t have a post operative MI (heart attack) is pretty incredible. She was in the hospital for 3 months. It took a year for all the fractures in her leg that was held together by pins and wires to heal. She was in agony the whole time. The pain medications did nothing. Because she couldn’t wear bear and because of the pain she stopped moving and her muscles began to waste and shorten. Her leg healed shorter and the muscles around her hip are so contracted she can barely move with a walker. Seeing her shuffle hunched over like Quasimodo is heart wrenching. I went to medical school where my mom had surgery. I was told Surgeon A was a regular hip guy. Surgeon B was the guy who came in for the hard cases, to fix what no one else could fix. 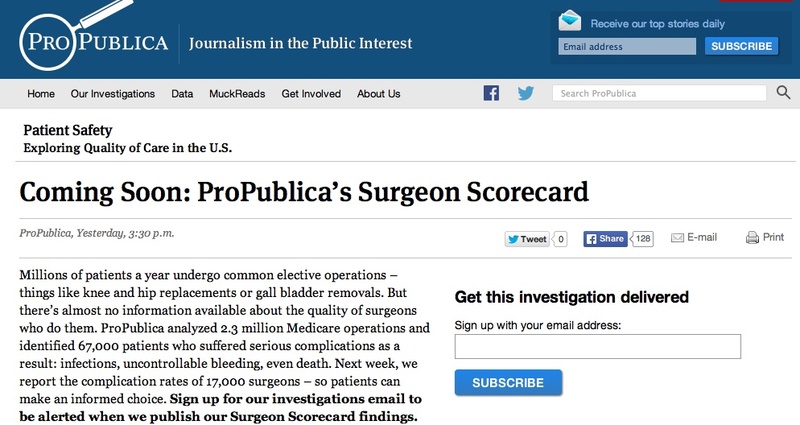 ProPublica wants patients to have information about their surgeons – they aim to publish complication rates. There are many people who have unnecessary surgeries and there are sadly too many preventable complications and deaths. Could data about surgeons help people make informed choices? Here’s my concern. There are unnecessary surgeries and preventable complications. There are also necessary surgeries and unavoidable complications. Will their analysis of the data set distinguish between the two or is this just raw data? Surgeon A: 7 day admission, no blood transfusions, infection. No in hospital complication. Surgeon B: 90 day admission, 4 units of blood, post operative infection, hospital acquired infectious diarrhea. However, knowing what happened to my mother’s hip I don’t “assign” any one of those complications to surgeon B and in fact they shouldn’t “belong” to him at all. My mother had a lengthy, technically complicated 2nd surgery. It takes time to wires fragments of shattered bone together, especially when they crumble on contact. Sometimes a long surgery signals a bad surgeon, but sometimes it signals a difficult surgery. My mother was on blood thinners, had a long surgery, and was 79 1/2 so could tolerate less blood loss than a 40-year-old so she needed a blood transfusion. She had 2 surgeries within 8 days, the second took more than 6 hours, and she needed blood so she so she had every risk factor for a wound infection. She needed antibiotics to treat this infection so was a set up for hospital acquired infectious diarrhea. My mother had the best of care and every precaution was taken, yet she had all of these “preventable” complications. If you just look at the raw data you might think Surgeon A was better and Surgeon B was worse, but surgeon B saved my mom’s life and did the best anyone could with her leg. In my mind if my mother’s complications of surgery length, blood loss, infection and diarrhea belong to anyone it should really be Surgeon A. But there was no fracture to be seen on the first x-ray and she had the standard of post-operative care the first time around, so should my mother’s complications from her 2nd surgery “belong” to anyone? If the ProPublica data looks at readmissions then Surgeon A will get a ding for that, but will the data say why someone gets readmitted? People get readmitted because they fall or because they didn’t take their anticoagulation medications correctly or because a surgeon missed a fracture on the x-ray or because the pre-operative antibiotics were missed and they now have an infection. Will the data be analyzed in such a way to distinguish clearly between them, because the first two do not reflect on the surgeon and the last two do. It is also incorrect to say that surgeons control or prevent all post operative complications. What if the post operative nursing care is bad and medications doses are missed? What if the surgeon works next to a nursing home? Fractured hips from assisted living facilities have the highest complication rates? Will the ProPublica data set control for diabetes, obesity, pre-operative infection, use of oral steroids and the thousands of risk factors that contribute to complication rates? In every field they are surgeons who do what other surgeons can’t and who “fix” what no one else can. Surgeons who take cases in patients who are very high risk because of obesity or diabetes or other factors but still need surgery. They will have higher complication rates because they have harder cases. My concern is releasing data that isn’t properly cleaned and analyzed the surgeons who are like my mother’s Surgeon B, the ones who can repair anything, might start to rethink their cases. What if every surgeon only operated on the good candidates? People at higher risk for complications will suffer and we will never get surgeons with superior skill sets. Raw numbers without context and appropriate analysis mean very little, just like the vaccine registry data. Here’s an event that should put it in perspective. Landing a plane anywhere but a runway should be a never event in aviation. If you look at just the outcome of landing a plane on the Hudson river that is a never event, a complication if you will. However, knowing that Captain Sullenberger did that because he had a double bird strike and lost both engines means that he had that rare combination of extraordinary skill, training, and experience. Here’s hoping ProPublica has the right data and is able to analyze it taking into account all the variables that affect a surgeon’s complication rate. If they don’t we might find patients selecting surgeons who have fewer complications not because they are better surgeons but because they only take low-risk, compliant patients who maybe didn’t even need surgery (yes, that happens – and very healthy people who don’t really need surgery have the best outcomes) and good surgeons unwilling to operate on difficult cases because they don’t want to affect their scores. « Can quantum mechanics explain homeopathy? Hi Dr. Gunter. First, so sorry of the pain your mom went through. I know how hard that can be. However, this is one of the very view times that I actually completely agree with you. I think it’s silly to use ratings for even minor treatments, or even to select a primary care doctor. Why would I let some lay person’s opinion about their provider affect my choice. I certainly won’t try to scan a set of data for the “best” provider either. By the way, I have a Masters in Computer Information Systems, so I have a decent understanding of how data can used (or ignored). In the UK, cardiac surgeons have done this. There has always been the problems you identify, that some surgeons take ‘easy’ cases and have good results; others take ‘hard’ cases and have less good results. To add to that there is the anecdotal suggestion that there are ‘lucky’ and ‘unlucky’ surgeons. Putting all this as accurate statistics is very difficult. Perhaps you should go to a surgeon that other surgeons go to. Add to it bundled payments and surgeons may even lose money on complicated cases. The tabloid-style promotional video for the story should be taken as indicative of their aims. Anyone who permits a story to be promoted in that way cannot be trusted to honestly and seriously address the data, including potential shortcomings, etc. So sorry your mother had to go through that, sounds absolutely miserable. I’m a researcher working with orthopaedic surgeons and heard this idea of having outcomes used to quantify surgeon skill/excellence for patient info and reimbursement at one of the recent grand rounds. My first thought was on how that would influence treatment of difficult cases, so I was very interested to read your thoughts on this. Thanks for the thoughtful post! Oh dear this sounds like the family doctor’s equivalent called Rate your MD. Except there is no actual data to promote just any nameless person who wants to rant on about how awful you are without having to account for their reasons. And people live by these kind of ratings. Crazy! Jen, wonderful post. I use the “Humpty Dumpty” metaphor myself. I’m wondering whether it’s possible patient selection was part of the problem? Was this “hail mary” surgery? Was she too old and fragile to undergo surgery at all, and would standing pathave been a better approach, even though she was in pain and having trouble moving? My opinion as MD. The second surgery should be charged to the first doctor as a readmission. And, probably as you said “There are unnecessary surgeries”. So for your mother “a 79 1/2 year old woman who has a shattered osteoporotic femur that holds a nail like glass” I won’t recommend her a surgery.